Friday in Chattanooga – Let's Go RVing! For us we got a fairly quick start this morning as we were headed to the Creative Discovery Museum and had no idea how long we would want to spend there. Got the address put in the car GPS and headed out. Interestingly, when we paid for our admission Jerry and I were given pink wristbands to wear and were told that we could come in and out of the museum anytime during the day. The children didn’t have to wear any kind of identifying band. 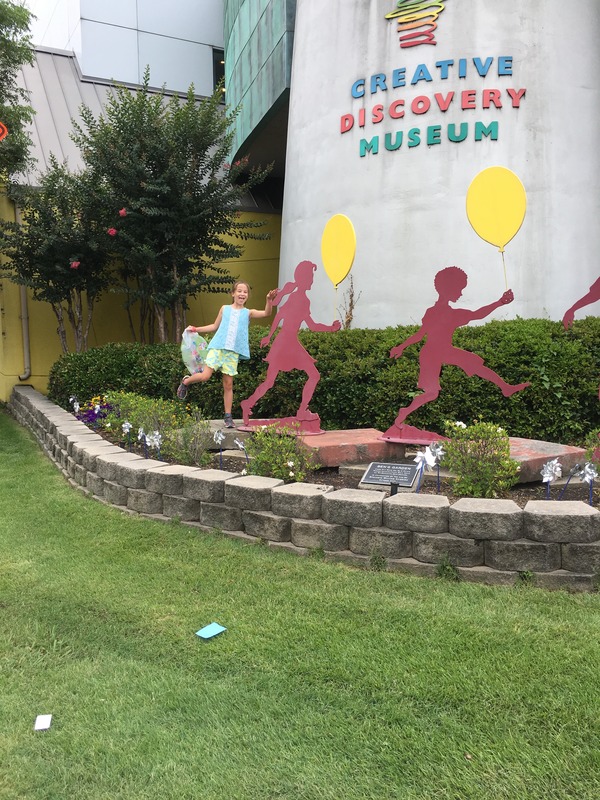 The museum, a children’s museum located right downtown in Chattanooga contains art, music, science and an area called River Play, a two story tall exhibit with a “riverboat” for the little ones and then a larger area for older kids. Emma was running up and down the twisting tunnels so quickly that it was difficult to keep my eyes on her. Within this area is a water table where kids can learn about locks and dam systems. They have a bevy of toy ducks that you could put in the “steam” and watch them as they navigated the path. Another amazing exhibit was the lightning dome. When your hand is placed on the dome electricity is generated and you can see the various strain of current. Another section is devoted to music with different instruments and their sounds. Still another area is the health center where you can be weighed (yeah I did and decided to have another ice cream cone later), get your pulse taken, have your eyes checked. It was totally fascinating. Another interesting area was the dinosaur exhibit where they had a large “skeleton” of a dinosaur. Emma wasn’t as interested in this as Eli would have been. Upstairs was an entire area devoted to Eric Carle, author of The Very Hungry Caterpillar. Upon entering there was an area of tall glass fronds which you could tumble into. Adjoining this was an outdoor science demonstration showing how simple machines worked. There was also a large checker board with black and white checkers that could be moved around. It was amazing and Emma was so excited that she couldn’t decide what to do first so just ran from one station to another. Naturally we finally ended up in the gift shop where Emma’s money was burning a hole in her pocket. She finally decided on some modeling clay and a stuffed animal. Jerry was able to find a gift for both Eli and Olivia as well. Our next mission was lunch and after wandering around for a while we decided on Five Guys. Emma got a junior burger and Jerry and I both wished we had. Ours were huge! After about two bites mine fell apart so I started eating it using a knife and fork. That worked much better. We only ordered one order of fries but Jerry said when they put the burgers in the bag along with a cup of fries they just dumped a large scoop full of fries in the bag. We left a lot of fries. Our next stop was the store advertising moon pies and RC Cola, apparently something Chattanooga is famous for. Emma got dipping dots and we sat outside while she ate. We then headed to the Chattanooga Choo-Choo but by the time we got there we decided to forego that activity and headed on back to the campground. Jerry decided that he wanted to take a nap so Emma and I decided to go to the pool for a swim. I can’t believe we haven’t been all week because it’s a nice pool although the depth markers seemed a little off. It was nearly over my head at 4 feet and I’m 5”6”. It was a great day for a swim and we thoroughly enjoyed it. Lots of fun and laughter with our sweet girl. After the swim we discussed what to do that evening. Our choices were go swimming again, do nothing, or go to the Chattanooga Cleveland Horse Show. We finally decided to go swimming although that never came to pass. After dinner Emma and I sat outside and then all three of us went to the nearby Baskin and Robbins for ice cream. All in all it was a wonderful day and week. I told Emma today the only bad thing about having her spend nearly a week with us is that it makes us miss her that much more when we’re apart. She has been the sweetest girl this week and at times such a trooper in the heat and humidity but rarely complaining and always compliant.